07 04 2010 - Following a similar recent prediction by IDC, market research firm Gartner has predicted big growth in the smartphone market in the next couple of years, with Symbian all but disappearing and Android leading the way. 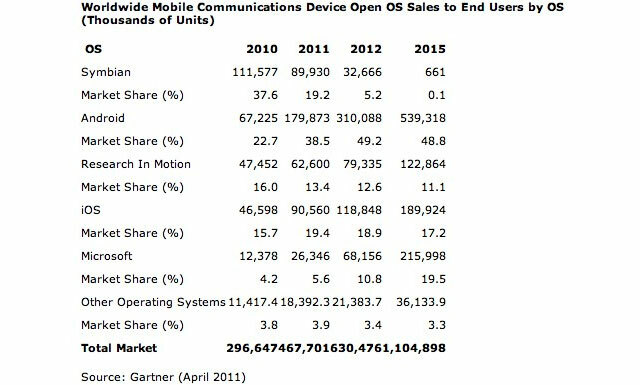 Gartner predicts worldwide smartphone sales will reach 468 million units in 2011 and Android will command 38.5% of the smartphone market. By 2012, that rate will increase to 49.9%, but it will drop slightly to 48.8% by 2015. This is where we get skeptical about predictions such as this one. Yes, based on Android’s track record it’s fairly safe to say that it will grow significantly in the next year or two, but we’d stop shy of saying that it will actually lose some of its projected market share three years later. Symbian, now more or less abandoned by everyone, will lose a tremendous amount of market share in the next two years, ending with a meager 0.1% in 2015, Gartner predicts. Windows Phone 7, largely due to Microsoft’s partnership with Nokia, is predicted to grow to 10.8% market share in 2012 and should further increase to 19.5% in 2015. Apple’s iOS is predicted to have a 17.2% market share in 2015, followed by BlackBerry with 11.1% and other platforms are predicted to have 3.3% market share. Again — just like in IDC’s prediction — this positions Windows Phone 7 as the number two platform on the smartphone market, and again, we think that this is a very bold prediction. A lot can go wrong with Microsoft and Nokia’s partnership in the next couple of years, and Apple has been doing almost everything right when it comes to the iPhone and other iOS devices.